Our Winter time fishing is in full swing now with good numbers of Sailfish showing up and mahi that are still eating up our kite baits. The bait migration has begun and all of the pelagic fish are close behind. Typically this time of year we like to kite fish with live goggle-eyes fishing 3 baits off each kite. This is very effective for catching Sailfish, Mahi, Wahoo, and Tuna off of Key Largo. Our last trip out was very productive with the kites. We managed to hook a Sailfish as soon as we set our lines out. Then we got covered up with mahi all day catching 25 of them. The Sailfish bite has been steady averaging 1 to 2 releases a day, however this should only get better with 5 to 8 releases becoming common as the winter progresses. Using 20 lb. test with light rods make this very challenging and exciting. When the wind lets up and the kites wont fly we turn to bottom fishing. The cooler water tempatures this time of year is great for catching mutton snappers on the patch reefs in 20 ft. of water. We like to use 20lb. spin tackle with live pilchards or ballyhoo as bait. We will anchor on the reef and chum for these snapper using cut ballyhoo and frozen menhaeden chum. You can catch Snapper up to 12 lbs. These fish are very strong and can run you right into the reef. Out deeper we fish wrecks in 200 to 300 ft of water. This is were the big guys live. Amberjack averaging 30 to 50lbs. and grouper 20lbs and above are quite common. We use heavier gear for these fish, typically 80lb. stand up tackle. 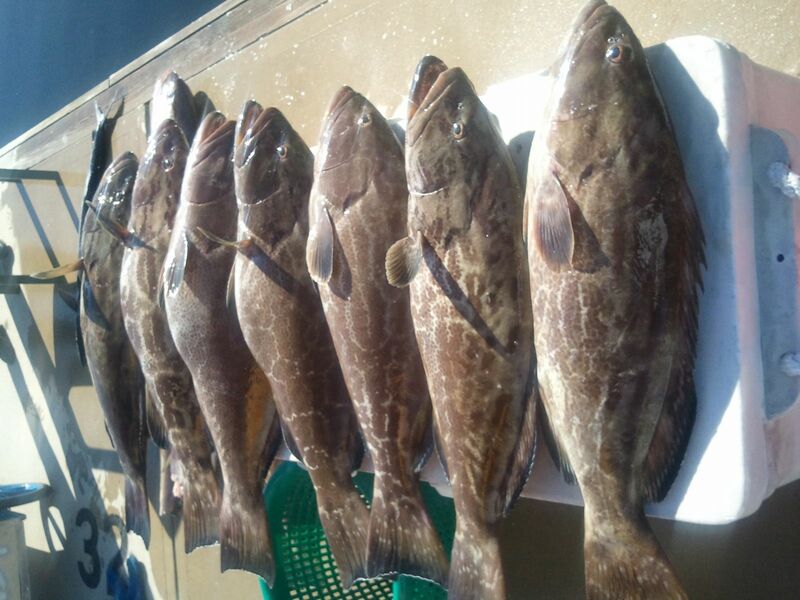 Last week on one of our charters we ended up with a nice bite of Groupers catching our limit and also catching some nice amberjack. Our Winter time fishing off of Key Largo is very Diverse and and the chances of catching fish is excellent.